The overall polymer imports of Turkey shrank by 6.5% in 2018 when compared to the record-high imports of the previous year. This slump was highly expected given the rapid depreciation of the lira against the US dollar, particularly in the second half of the year. 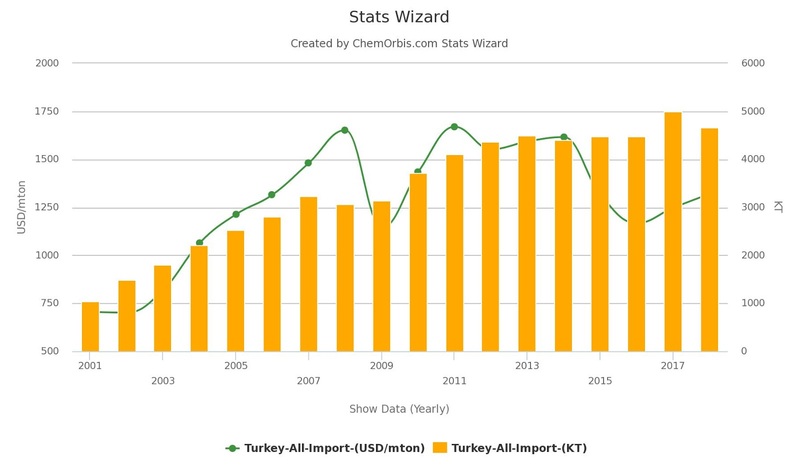 As can been seen from the graph below prepared by ChemOrbis Stats Wizard, Turkey’s overall polymer imports have been steadily growing since 2001, disregarding the small drops in 2008 and 2014. Although this growth lost steam after 2012, a record was achieved in 2017 with more than 5 million tons of imports. The dramatic appreciation of the USD against the Turkish lira, needless to say, had its toll on the import volumes of 2018; however, 6.5% is still not considered a major drop as statistics still show 2018 as the second-highest year of imports. Turkey’s top five polymer suppliers remained the same as the previous year with Saudi Arabia standing at the top and South Korea, Iran, Egypt and Belgium respectively following. As a result of the decline in overall imports in 2018, many exporters lost share in Turkey except for Saudi Arabia. Overall polymer exports of South Korea and Egypt to Turkey was down by around 5-6% year-over-year while imports from Belgium were down by 4%. The largest loss was seen in Iran with a more than 20% yearly decrease. Imports from Iran slowed down visibly particularly after August, when the sanctions were first put back into force. Cumulative imports from Iran between August and December 2018 display a drastic decrease of more than 50% in Turkey when compared to the same period of 2017, according to ChemOrbis Import Statistics. Among the top five suppliers, Saudi Arabia was the only country raising its export volumes to Turkey in 2018. Imports from Saudi Arabia grew by more than 6% on a yearly basis to breach 1-million-ton-threshold, hitting a record-high. As a standalone product, homo-PP imports continued to keep the largest share among other polymers. After hitting a record-high in 2017, Turkey’s homo PP imports were down marginally by 3% in 2018. However, they still stood above the 1.5 million-ton-threshold and 2018 became the second year with largest imports since 2001. Likewise, PP block copolymer imports were only 3% lower from the previous year. Saudi Arabia managed to export 11% more homo PP to Turkey throughout 2018 on a yearly basis, staying at top of the list. Meanwhile, imports from Iran dwindled by 33% on year, falling to the 6th place from the previous year’s 4th place. Although Egypt remained as the second largest supplier, it exported around 10% less than the previous year. However, India filled the gap by raising its homo-PP exports to Turkey by more than 16% on year and moving up to the 4th place. In the PE market, the most visible decrease was seen in the HDPE market. ChemOrbis Import Statistics reveal a yearly decrease of 12%, the first time imports fell below 600,000 tons since 2011 for this product. This decrease occurred even before the implementation of the compulsory fee on plastic bags as of the start of 2019, which heavily weighed on HDPE film demand in January. Unlike in PP, Saudi Arabia and South Korea suffered from this decrease the most as imports from these countries respectively fell by 12% and 27% on year. Iran remained as the top supplier with a small drop of around 2% year-over-year. Statistics also display a small drop of 3% for overall LDPE imports. Saudi Arabia and Belgium increased their exports to Turkey by 20% on year to move up to the top two places, while Azerbaijan exported 20% less in 2018 with respect to 2017 to be the third in the list. Players in Turkey reported problems about the accuracy of the statistics of LLDPE imports obtained from TurkStat. This is assumed to be stemming from the complications in the application of the tariffs for LLDPE, metallocene LLDPE and MDPE. Therefore, the total of LLDPE and mLLDPE import volumes are taken into consideration, which implies a similar amount of imports from the previous year. As a result of the new capacities coming online in the US and aggressive exports made throughout 2018 particularly in the last quarter, overall LLDPE imports for this origin rose considerably to 81,000 tons in Turkey, 9 times larger than 2017. ChemOrbis Import Statistics suggest a yearly decline of 15% in cumulative S-PVC imports, the lowest volumes recorded since 2009. Imports slowed down particularly in the second half of the year, weighed by the depreciation of the lira. Otherwise, there was a 10% increase in PVC imports in the first half of the year in a yearly comparison. Unlike LLDPE, PVC suffered from the US-Turkey relations the most throughout 2018. Imports from the US plunged by almost 50% when compared to the previous year as a part of the retaliatory measures taken by Turkey against the US starting from May 2018. Turkey resumed issuing inward processing certificates for US imports in early September after imports were restricted in May. However, interest remained rather low due to the difficulty in affording a letter of guarantee with 6.5% customs duty, 50% additional duty and 18.81% antidumping duty. No PVC imports were reported from the US in September and October while only a limited amount of imports were concluded in November and December. Cumulative PS imports reduced by 22% year-over-year, according to ChemOrbis Import Statistics. PS imports from Iran wound down by 20% on a yearly basis as a result of antidumping duty investigation that started in May. Meanwhile, a domestic producer’s PS sales from Yumurtalık Free Zone were up almost 20% in 2018 from 2017. ABS imports were down by 14% and EPS by 8% on year. Excluding the sales of a domestic producer from European Free Zone, PET bottle imports display an increase of 6% on a yearly basis. However, the producer’s sales from the free zone appear to have slumped by 16% on year. China shined out in Turkey’s PET imports in 2018, implying an increase of more than three times from 2017 and moving up to the top of the list of major import suppliers. On the other hand, India lost 29% year-over-year. PET textile imports rose by 17% to a record-high in 2018, based on ChemOrbis Import Statistics. South Korea appears to have raised its exports to Turkey by more than 55% on a yearly basis for this product. 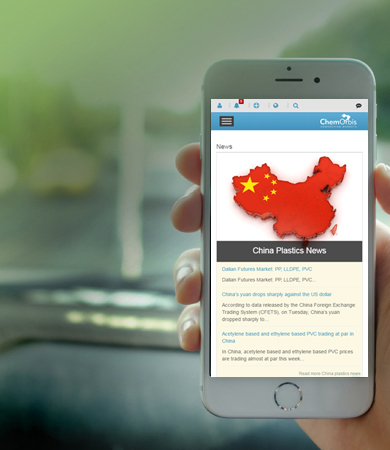 Please visit ChemOrbis Import Statistics by product and ChemOrbis Import Statistics by country . Please visit ChemOrbis Stats Wizard under Analysis Tools section.